You're dreaming of becoming a teacher, but the QTS professional skills test seems daunting. JobTestPrep has created a comprehensive PrepPack™ to prepare you for the QTS skills test. Let JobTestPrep help you practise so you pass the first time, saving you both time and money. The qualified teacher status (QTS) professional skills test qualifies you to become a teacher. Featuring our carefully prepared QTS professional skills test practice tests and questions, full answer explanations, and study guides and tips, our PrepPack™ is sure to get you ready for your exam. What Is on the QTS Professional Skills Test? The QTS professional skills test assesses teachers' ability to perform basic professional duties. It does not assess the capacity to teach their subject, but rather to prove their competency in basic skills. There are six total test areas on the exam, broken into numeracy and literacy sections. The QTS numeracy test incorporates both mental arithmetic and written arithmetic and data questions. The test is approximately 48 minutes long and contains a total of 28 questions in two different tests—12 mental arithmetic questions and 16 written questions, plus an additional, unscored QTS practice question. The QTS literacy test includes spelling, punctuation, grammar, and comprehension questions. The test is approximately 45 minutes long and contains a total of between 41 to 49 questions, depending on the test. The literacy section is divided into four different sections: spelling, punctuation, grammar, and comprehension. The QTS professional skills test can be challenging because the questions are not necessarily made up of material you inherently know or that were part of your training. These are questions the likes of which you probably have not practised in a long time. That is why it is important to practise early and often when it comes to this type of test. While you can sit the exam three times, only the first time you take the test is free of charge. Failing it will cost you time and money, as you will be charged for any subsequent attempts. Prepare in advance to ensure you pass the first time. JobTestPrep’s developers have created a PrepPack™ that mimics the real QTS professional skills test. Studying in advance prepares you for test day, offers revision tips, and lets you practise answering questions similar to those you will find on the actual test. Our QTS practice tests provide you with the skills you need. Don't bother buying professional skills test revision books when you can practice online with JobTestPrep's questions, full answer explanations, tests in timed and untimed mode, and study guides and tips. You can practise until perfect. QTS literally stands for qualified teacher status, and in order to get this status, you need to pass the professional skills tests. This process does not involve merely taking a simple test, but rather many steps involved, which are outlined below (in the FAQ section). Applicants must register online with learndirect. You will need your reference number or TRN to register if you started teachers' training before July 2013. If you are applying before teacher's training, you don't need a TRN. As soon as you are registered, you will receive an email informing you that you are now eligible to book a date and time to sit the exam. When you receive the email confirming that you have registered for the exam, you can book your test using the link provided. You can sit your test anywhere in the country, but you will be offered the five nearest testing centres closest to your home. To make sure that you are fully prepared and understand the process, test, and steps involved, JobTestPrep has outlined some of the most frequently asked questions below. What is the qualified teacher status (QTS)? 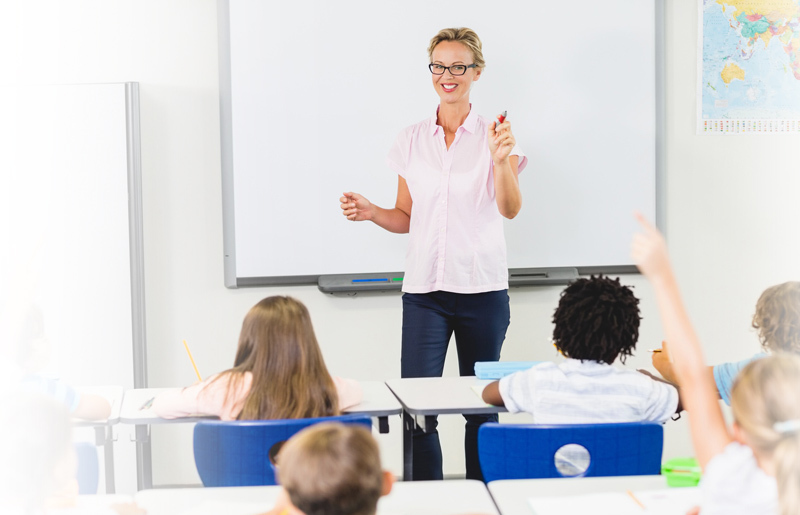 The qualified teacher status (QTS) is the professional qualification that teachers are required to attain before being permitted to teach in state-maintained schools in England. When and how should I book my QTS skills test? You should book your QTS skills test as soon as your application has been approved. You will receive an email with a link to book your test in any location it is given. You can sit your test at any time, but make sure you book it with plenty of time before beginning your teacher's training, as in most cases passing the professional skills test is required before doing so. What is the QTS professional skills test pass mark? You must score at least 63% to pass the exam and qualify for QTS. The QTS pass mark is the same for preschool, primary school, and secondary school teachers. A score report will be provided immediately upon finishing your test. To ensure that you do pass, it is imperative that you get QTS skills test practice. What is the DFE professional skills test? The Department for Education (DFE) is responsible for educating all children from preschool to secondary school up to age 19. The exam for reaching the status as a qualified teacher is the QTS professional skills test. What is the PGCE skills test? The Postgraduate Certificate in Education (PGCE), which trains graduates to become teachers within government-accredited schools, is a course in education in England, Wales, and Northern Ireland. The PGCE skills test is the same as the QTS test. What is a UCAS teacher training course? Universities and Colleges Admissions Service (UCAS) is an organisation that helps people apply to British universities. Its services include several online application portals, a number of search tools, and free information and advice. This course, in conjunction with the professional skills test, enables you to be qualified for the QTS. JobTestPrep offers a unique preparation package designed specifically to help you prepare for your upcoming QTS professional skills test. This pack contains three complete QTS mock tests as well as detailed explanations, score reports, and practice drills. This gives you the ability to assess your own performance and draw valuable conclusions. Start preparing today. QTS and other trademarks are the property of their respective trademark holders. None of the trademark holders are affiliated with JobTestPrep or this website.